So for the last... I want to say two weeks or so, I've been busy with non-FST things, and attempts to become busy with FST-related things were met with the whole of my workflow collapsing. Flashdevelop's debugger broke so hard in so many ways that I considered burning it all down and switching everything over to Haxe. I mean, I might still, but I managed to get everything working for now. 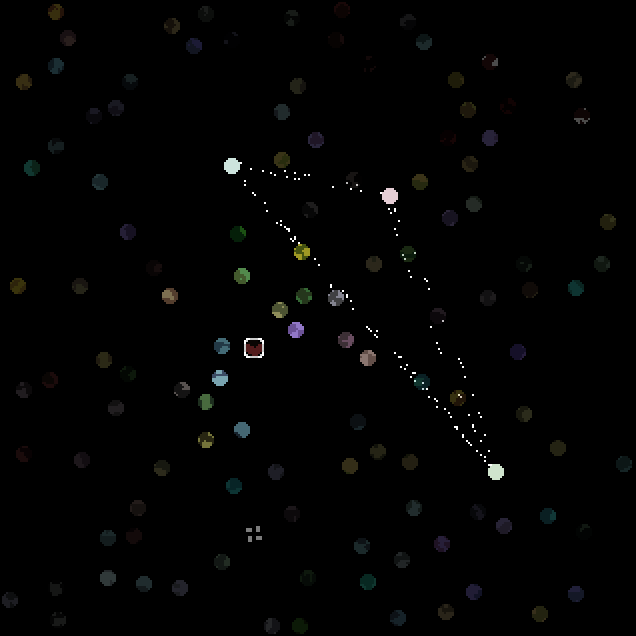 THEN I MADE PLANETS MARGINALLY MORE FANCY! YEAH. PROCEDURAL PLANET COLORS. I'll fix starlanes and the black hole in a bit. Think it's going to be general UI touchups for a bit. Then CONTENT AGAIN WOO. I didn't flip a dang thing. Planet image generation is what I'm working on next, and hoo body. Let me tell you something about how I generate planet images. I don't. The method I was going to use is garbage and absolutely annihilates planet generation time. Might be an issue with how images are handled, more likely is just that I'm an idiot and need to fix this. I've got a backup plan that requires quite a bit more adjustments to the existing code, but that's sort of the whole point of all this. So basically no progress. Yay. NEXT TIME, THOUGH. NEXT TIME WILL BE PLANETS. EVEN IF I HAVE TO HAND-DRAW A BUNCH OF DIFFERENT PLANET SHAPES. FST Dev Blog 57 - Clouds Gather. Not Those Clouds. I've been pretty busy with things unrelated to the game proper, so I've spent my time just putting together a few more palettes and getting them all to play nice with the palette manager. That's really about it. I'd say I'm behind, but I'm just working through the big 'make things look not completely awful' bullet point on the ol' list of things that need doing. Again. It's like I need to hire an artist or something. Up next is either planet graphics or an actual backdrop for the jobs page. I'll flip a coin. I'm going to hold off on changing the background of Combat until I actually update the rest of Combat. Re-skinned all the buttons? Yup. Probably missed a couple and they still need to be relocated anyway. Added a new type of every portrait asset (backgrounds don't count,) which include squared jaws, mustaches, and what I hope looks like an approximation of slicked-back hair. Or dreadlocks. Use your imagination. Didn't add any palettes. Totally forgot to. But I added a whole portrait instead of one asset, so I'm happy. Finally fixed a tiny issue with buttons where they'd appear pressed until you moved your mouse away, regardless of whether or not you'd released the mouse button. Oh, also I arbitrarily dropped planets from 175 to 120. It very slightly cuts galaxy generation time. The map just looked crowded. I'm trying to put off re-doing planet image generation, map movement, the shop window overhaul, a jobs window overhaul (there are no visuals and also quest missions need better naming,) and the ever-looming combat re-touching. Maybe I'll just keep re-doing the visuals on things. Clear waters, not much chop. Dialog choice buttons no longer lock the dialogue to one single block of text, which is nice. Not that there's any tremendous blocks of text in the game at this time, but when there are, HOO BOY will I be glad that's fixed already. Copilot home planets are in place, though actually assigning them and doing anything meaningful is still a fair way away. I think these next couple updates are going to be visual things. Combat's sprites need some touching up, and that whole game state desperately needs a background. Planets are visually uninteresting, the shop window's text is abysmal, and to top it all off, I've still got the default Flixel buttons in a bunch of different places. Also I've resolved to making at least one new portrait asset each week. One and a single color for it's type. Maybe two. Maybe a whole set of sprites and a palette. Maybe I'll just finish the whole game in a week. Character saving is fixed and large portraits for characters in the bar window no longer hang around after you've closed a dialogue with them. I thought there would be other problems with the portraits afterward (what with them disappearing in conversations after the first,) but it turns out one fix fixed all the problems. At least for now, anyway. Next up is fixing choice buttons appearing too soon! Should be another quick one.